I am a purse and bag addict in case you haven’t figured that out by now. I usually gravitate towards simple, plain colored accessories but once in a while it feels good to sparkle! Here is a simple but fancy evening clutch; a small one that only fits your essentials. It really glamorizes a cocktail dress for an evening at the club, a formal dinner or wedding. This pattern is based off of a simple zipper purse design. However, instead of putting a bow over the top of the purse, the entire purse is turned into a bow by putting a strap in the middle. I love simple designs that I can whip up under an hour. This clutch took about 30 minutes. I took more time taking the pictures than making the actual clutch. The best part of this clutch however is not how fast it was to make but how much it cost. The entire project cost me ~$4. The most expensive items were the beads for the handle. This was a fun Sunday afternoon project and I can’t wait to show it off! Cut 2 pieces each of the outer fabric, interfacing and lining 10″x6″. Cut 1piece of strap and interfacing 10″x 6″. Yes, its all the same size! Picture does not show interfacing and shows strap folded. Iron on your interfacing to both your outer pieces and your straps. The only pieces not getting any interfacing is the lining. Pin it all the way down and sew the top part of your sandwich using your zipper foot. Now, do the same thing for the other side of your zipper: lining right side facing up, your entire piece that you just sewed with zipper pull facing up and your other outer fabric right side facing down. Once you sew your second set to your zipper sandwich, take to the iron and iron out your seams. Remember if you are using sequin fabric, DO NOT iron on the right side. Your sequins will come off with the heat from your iron. I learned this the hard way when I lost a bunch of my sequins that I may have to go back and glue on to my clutch. Trim off all your edges so that they aligned neatly together. Next, with your zipper opened half way, sew your lining pieces and outer pieces together leaving about a 4″ opening on the lining piece. Next, turn the entire thing inside out through your lining opening and topstitch the opening close. Lets move on to the straps. Fold your strap piece in half lengthwise. Fold in your side edges 1/4″ in and sew down (topstitch) lengthwise. You can also sew right sides together and then turn it inside out, but I always have a hard time turning small tubes inside out so I chose to topstitch mine. 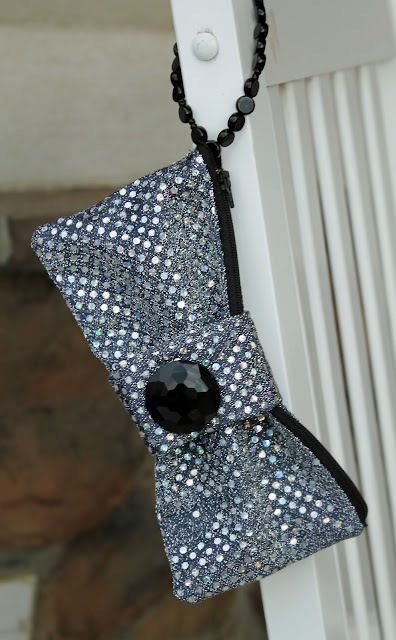 Remember not to iron your strap if you are using sequin fabric. Next, take one end of your strap and sew it to the middle of your clutch. Be careful and don’t sew through your purse, just through one sandwich. Next, fold the other end of the strap in about 2″ and sew. Add a button on top. For this project I used Velcro for closure but you can do snaps. I was just being lazy. The optional handle was made from a string of beads. Mine measure about 8″ in length but you can make yours based on how long you want it and where you want it sitting on your hands. To make this bead string, I threaded my beads through bead wire. I knotted the ends close and then sew it onto the side of my clutch. That’s it, you are done and reading to show off your creation to all your friends. I hope you have as much fun as I did making this gorgeous accessory. Please share your pictures! !